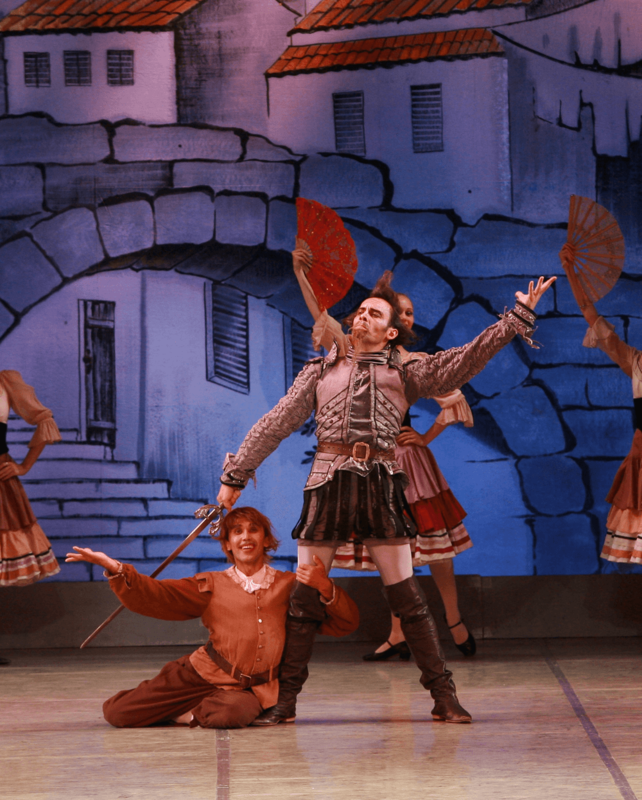 Don Quixote · "Russian National Ballet Theatre"
Don Quixote — based on an episode taken from the famous novel Don Quixote de la Mancha by Miguel de Cervantes. 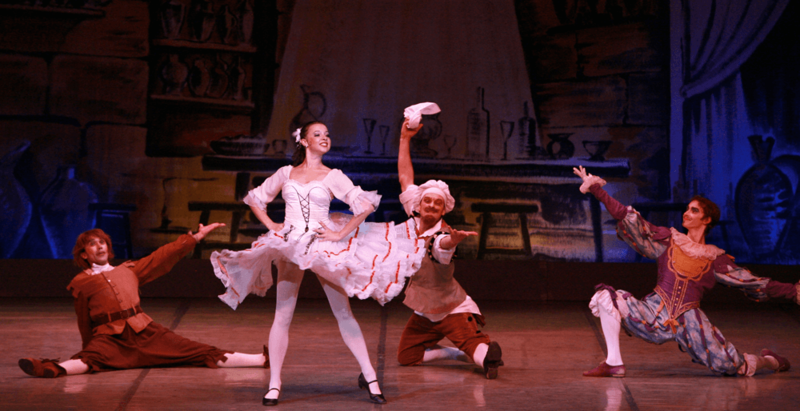 It was originally choreographed by Marius Petipa to the music of Ludwig Minkus and was first presented by the Ballet of the Imperial Bolshoi Theatre of Moscow, on 26 December 1869. 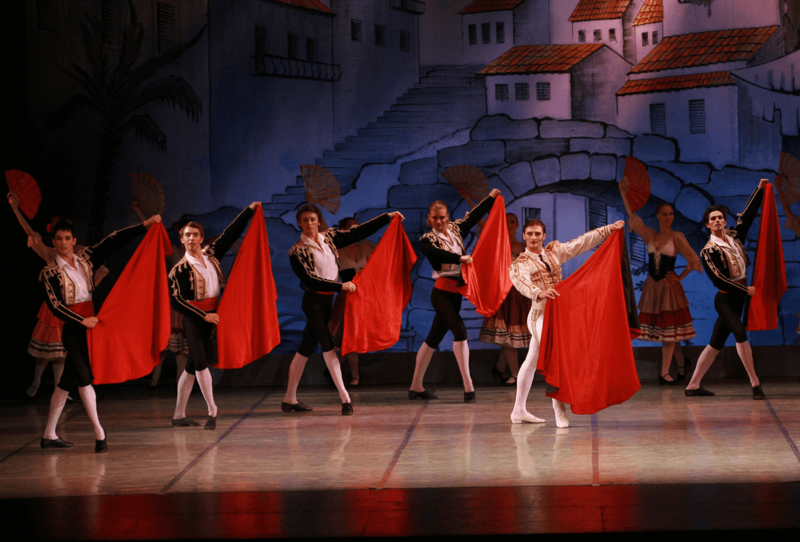 All modern productions of the Petipa/Minkus ballet are derived from the version staged by Alexander Gorsky for the Bolshoi Theatre of Moscow in 1900, a production the Ballet Master staged for the Imperial Ballet of St. Petersburg in 1902. In his library the old nobleman Don Quixote de la Mancha sits over his books, which tell him of distant times of knighthood. Soon he believes himself called to knightly deeds: he appoints his servant Sancha Panza his squire and sails forth into the world to seek adventures in the service of the beautiful Dulcinea, whom he has glimpsed in a vision. On a market-place Don Quixote and Sancho Panza mingle in the colorful bustle of the people. Kitri, daughter of the innkeeper Lorenzo, and her sweetheart the barber Basilio are among them. 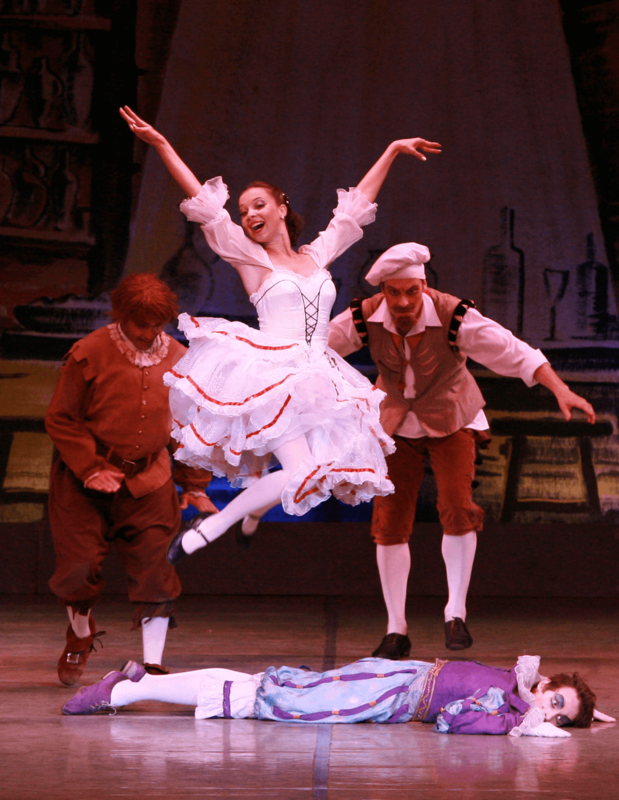 Their lovers’ tryst is suddenly disturbed by the entry of Kitri’s father. He puts forward the old, rich Camacho as the bridegroom he has chosen for his daughter. In vain, Kitri and Basilio swear their love. Lorenzo is adamant. 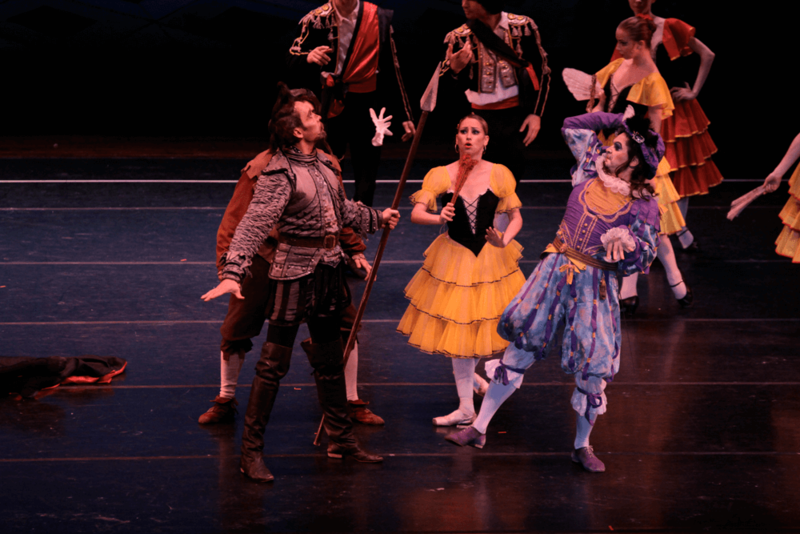 Don Quixote, who believes he recognizes in Kitri his Dulcinea, intervenes and helps the lovers to flee. 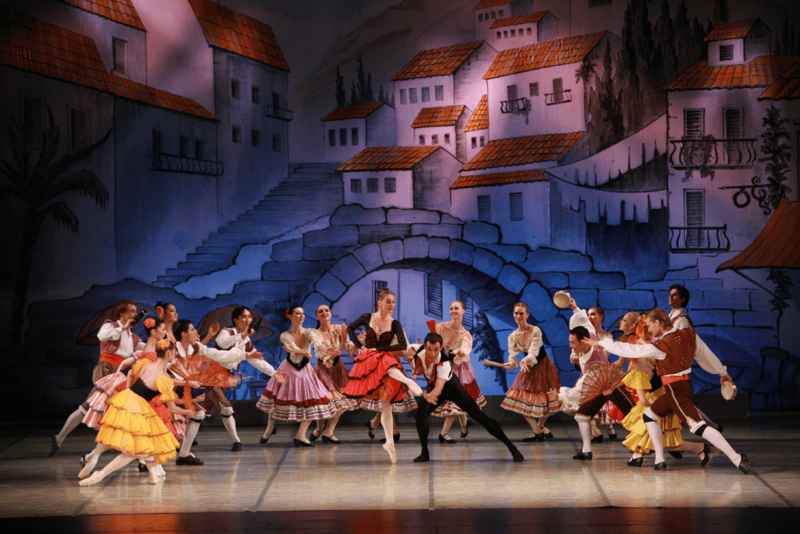 Kitri (who has disguised herself as a young man) and Basilio have found refuge with a band of gypsies. Don Quixote and Sancho Panza also appear on the scene, and in their honor the gypsies put on a puppet -show. Don Quixote, however, takes the play in bitter earnest and believes himself suddenly menaced on all sides by evil powers, against whom he must protect Kitri/Dulcinea—he destroys the marionette theatre and then charges against some windmills on the distant horizon, which he takes for giants. 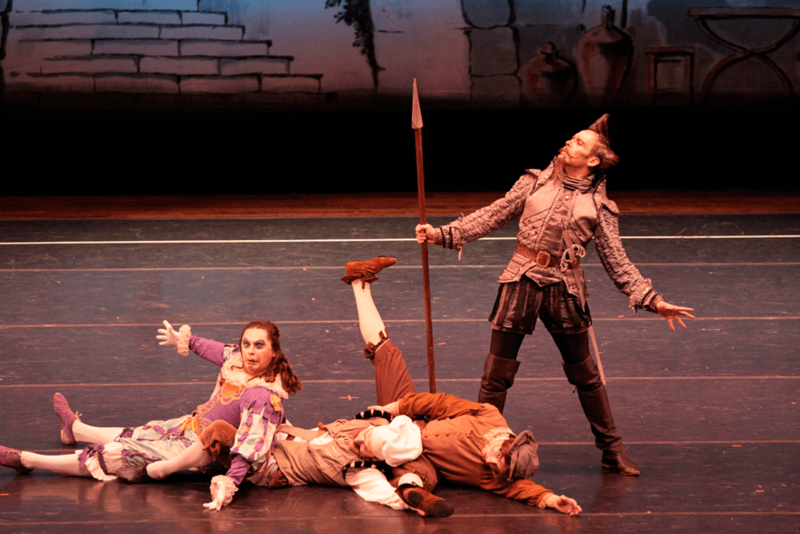 Don Quixote falls to the ground, where he remains unconscious. Comacho wakes Don Quixote from his dream and they both go to the Tavern. Meanwhile, Lorenzo and Camacho have succeeded in catching the fugitive Kitri again. She is now to be dragged to the altar by force and married to the old man. Basilio is in such despair over this that he is about to do away with himself. However in the nick of time Don Quixote and Sancho Panza appear, and everything turns out well—Kitri can marry her Basilio. It is fiesta time. Don Quixote watches the dancing. The scene changes to the Palace. 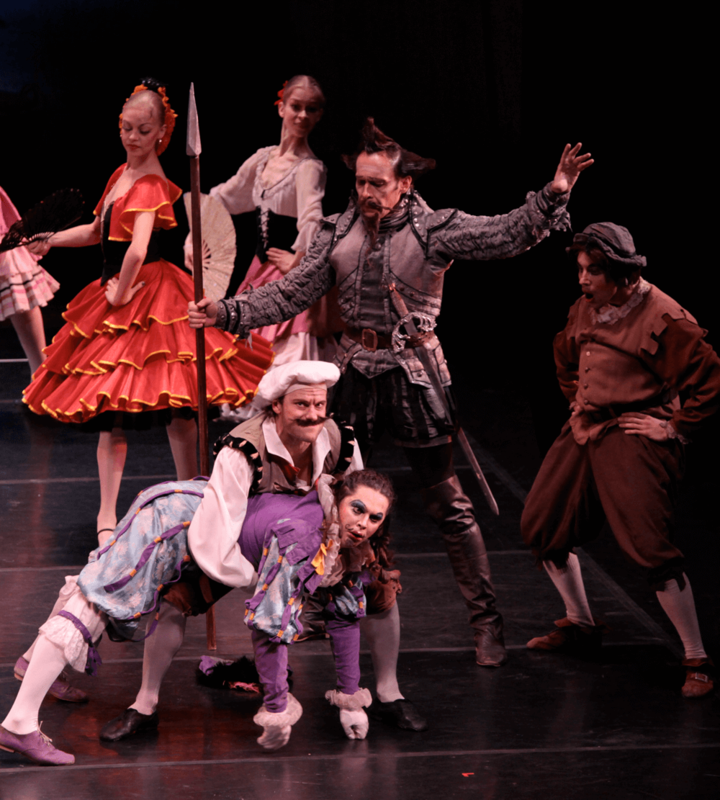 Kitri and Basilio with Don Quixote and the rest celebrate their wedding in a Grand Pas de Deux. Don Quixote realizes that he has not yet found his Dulcinea and with Sancho, sets off for more adventures.